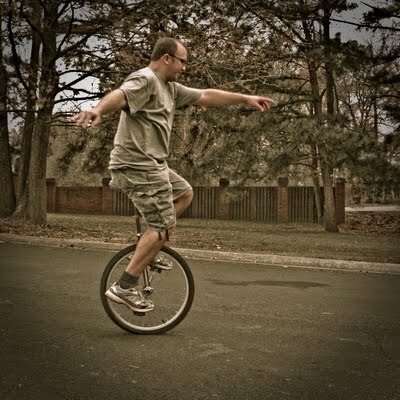 Sunday morning, after breakfast, we got out the unicycle so that Matt could give it another try. 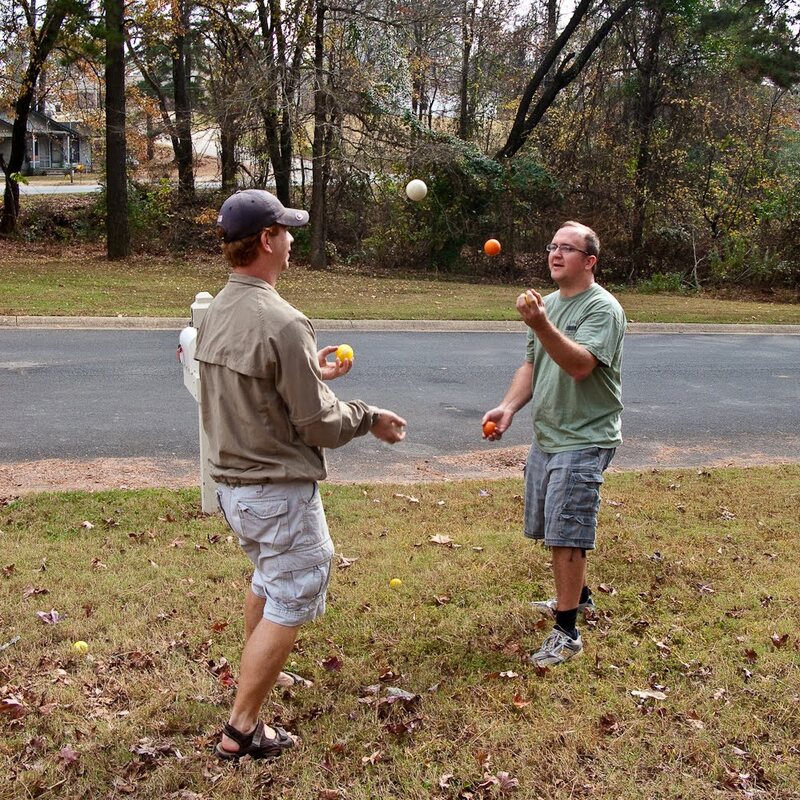 We had juggling balls and clubs out, too. 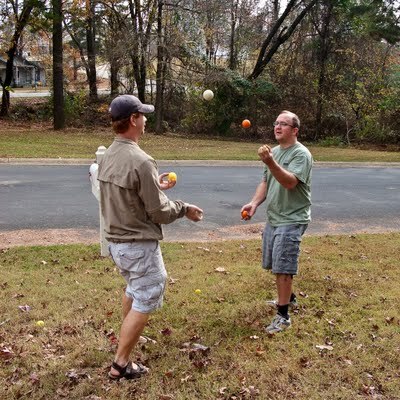 Bryan taught himself to juggle years ago, when he was in high school, and then he'd taught David down the street to juggle and to pass. 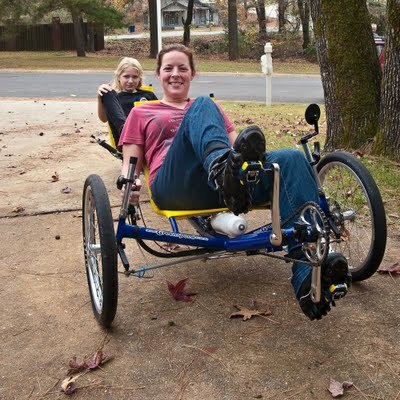 And Mandy gave free rides around the neighborhood on the GTT. It's funny. We had a whole circus in the front yard. We all took turns on the toys. As it turns out, Matt hasn't ridden a unicycle in years and could only get halfway to the neighbor's driveway. Bryan can ride for about twenty scary feet. When everyone else was done, Mandy got the unicycle and leaned on the car for awhile. Mandy has this odd little personality quirk. Occasionally she'll decide that she's going to do something ridiculous, something she's clearly unqualified to do. It's as if she just didn't get the memo stating its impossibility. I'd like to think this is consciously-directed determination, but really I think it's just a sort of unpredictable, uninformed intensity. The first time I really noticed it was when she was tiny, and learned to walk several weeks before she could even stand up. She'd just sort of launch herself into the room and move her legs until she fell down. Then she'd crawl back to where she started and try again. Years later, the week before her fifth birthday, she said "I am going to learn to ride a bike next week." I dutifully bought a bike, and it took her an hour and a half to learn to ride it. Then, nobody really told her that an eight year old couldn't do a ten hour wetsuit trip in a cave, and so she did. Watching her sit on the unicycle, next to the car, I had a feeling that she was going to decide that she would learn to ride. So I wasn't surprised to spend nearly all day outside in the street, providing an arm to lean on as she lurched down the asphalt on one wheel. I wonder how long this project will take?